We love eating Thai food but occasionally we need a little something different and a couple of weeks ago we had cravings for a couple of New Zealand favorites, wine and cheese. Thanks to Nic’s parents we had a lovely bottle of New Zealand red wine in the cupboard just waiting to be drunk. We had been saving it for a special occasion – having a craving is a special occasion, right? It wasn’t until we cracked the bottle open that we realized it was still Easter weekend so we had a special occasion anyway. 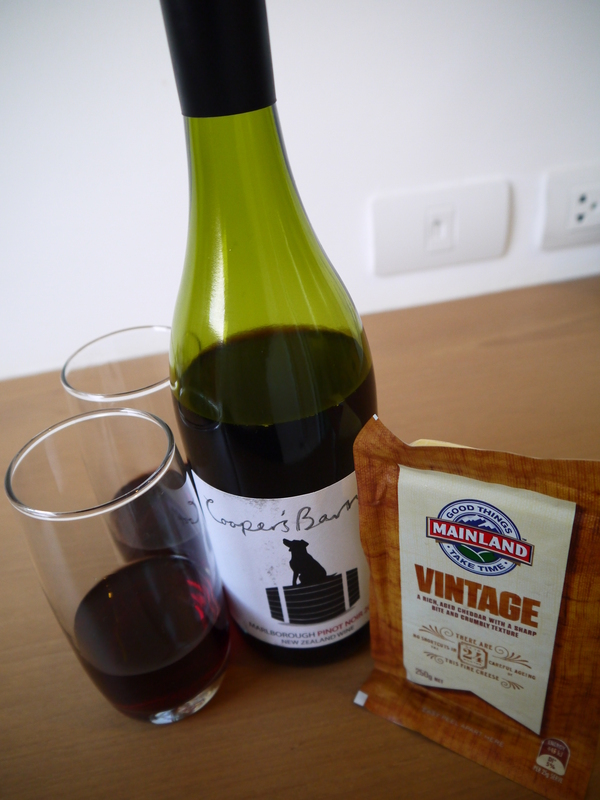 To go with our New Zealand wine I purchased some delicious vintage NZ cheddar cheese from our local Tesco supermarket. You can find NZ wine and cheese in Bangkok relatively easily but often the range is very limited and the price is rather high so for us its an every once in a while treat that is truly savored. Feeling inspired by our delicious New Zealand wine and cheese I decided to make a simple spaghetti pasta. We don’t cook too often in Thailand – it wasn’t until Christmas that we actually got a fry pan and a couple of pots. My first attempt at making a pasta dish was a little underwhelming but this time I truly believe that the use of quality ingredients and maybe drinking some delicious wine really made the difference. Got my mouth watering over this one, Kristal! And we have to agree, a craving is definitely a special occasion! « New Year celebrations in Thailand – 3x the fun!